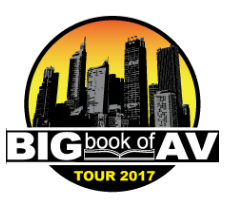 Stampede announced it will kick off the international leg of its 2017 Big Book of AV Tour & Conference Series on March 23rd, 2017 at the Westin Wall Centre, Vancouver Airport from 10:00 AM to 2:00 PM. Registration for the event is now open. The Vancouver event will begin with a dealer panel at 9:00 AM followed by a Tech Showcase Exhibit at 10:00 AM. At 10:15 AM, the presentations will commence, covering a variety of topics including: “NEC 10 Steps to a Successful Video Wall” by Mark Weniger, Account Manager, Channel Sales, NEC; “Overview of the Drone/UAS Industry and Business Potential” by Paul Dragos, Drone Video Systems; “WePresent Presents: Cut the Cords: BYOD and Wireless Presentation from Any Device” by Ed Pham, Regional Sales Manager, WePresent; “Drone Video Systems: A New AV Category for a New Age of Opportunities” by Rob Luther, Drone Video Systems; and finally, “FIREFX - Basics of Securing IoT Networks for the Home and Business” presented by Mike Berman, SVP of Business Development, FIREFX.